The limestone in Denmark is lying near the soil surface in a stretch from Thy, through Himmerland and Djursland continuing through Mid-Seeland to the island Mon at south-east. On Djursland the limestone is exposed along the eastern coast in up to c. 10 m high cliffs. Limestone makes the soil very alkalic and poor in some nutrients. A number of plants are characteristic on chalky ground. 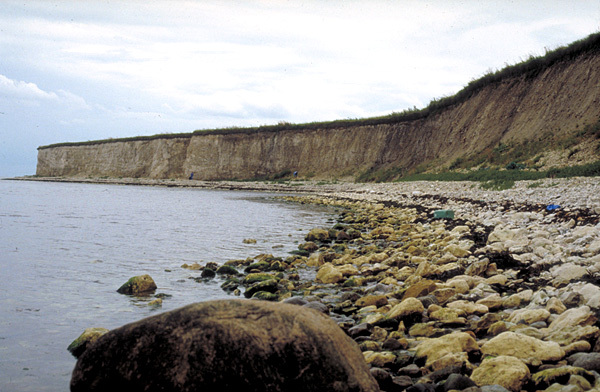 The picture shows limestone cliffs near Sangstrup on the tip of Djursland. The cliffs near Sangstrup are really a visit worth during low tide. The sea shore is not sand but limestone and allmost look like the tropical coral reefs with lots of interesting organisms. Back to Dansih Nature and Vegetation.